A 32-year-old Hailey man has been charged with felony DUI in Blaine County for a July incident because of a prior felony DUI conviction in California in 2004. Ramiro Godoy-Espinoza pleaded not guilty to the charge at arraignment Aug. 21 in Blaine County 5th District Court. He also pleaded not guilty to a misdemeanor charge of driving without a driver’s license. Judge Robert J. Elgee scheduled a jury trial to begin Nov. 19. Godoy-Espinoza remained incarcerated Tuesday in the Blaine County jail on $25,000 bond. The Roark Law Firm in Hailey has been appointed public defender. Godoy-Espinoza was originally charged with misdemeanor DUI following his arrest by the Blaine County Sheriff’s Office on July 2. The charge was amended to a felony on July 11 after the Blaine County Prosecuting Attorney’s Office became aware of his California felony conviction. Idaho law provides that a person can be charged with a felony on a new DUI charge if that person has a prior felony DUI conviction within 15 years of the new charge. 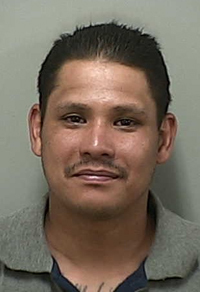 Godoy-Espinoza’s latest DUI arrest occurred after a sheriff’s deputy allegedly saw him driving recklessly at about 8:30 p.m. on July 2 on state Highway 75 north of Hailey. Deputy Brad Mecham wrote in a probable-cause affidavit that he was stopped on Zinc Spur Road observing highway traffic when he saw a black 2000 Ford Excursion, driven by Godoy-Espinosa, cross the center line into the northbound lane. Mecham wrote the vehicle was then “jerked back into the southbound lane,” where it then crossed over the fog line and onto dirt on the highway shoulder. The deputy wrote that he then initiated a traffic stop. Mecham reported that Godoy-Espinosa was arrested because he smelled of alcohol, had slurred speech, impaired memory and glassy, bloodshot eyes and failed field sobriety tests. Mecham reported that once in custody, Godoy-Espinosa refused to take a blood-alcohol breath test.